Mike Ullery|Miami Valley Today file Piqua’s Kathy Young returns to the softball team this season. 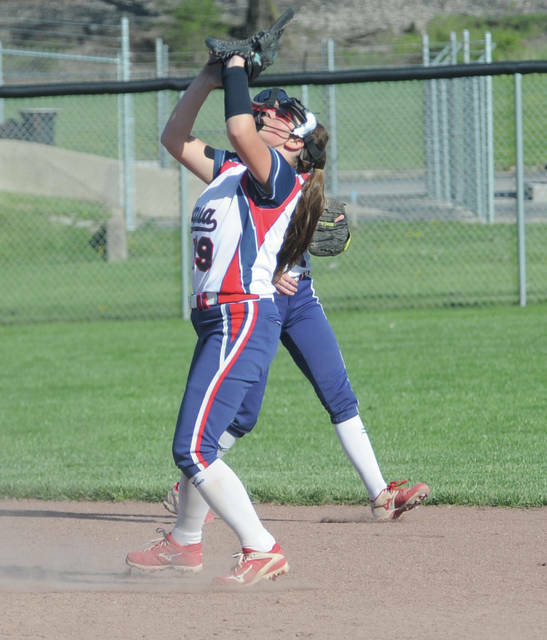 Miami Valley Today file Covington’s Layklyn Kemp makes contact during a game last season. 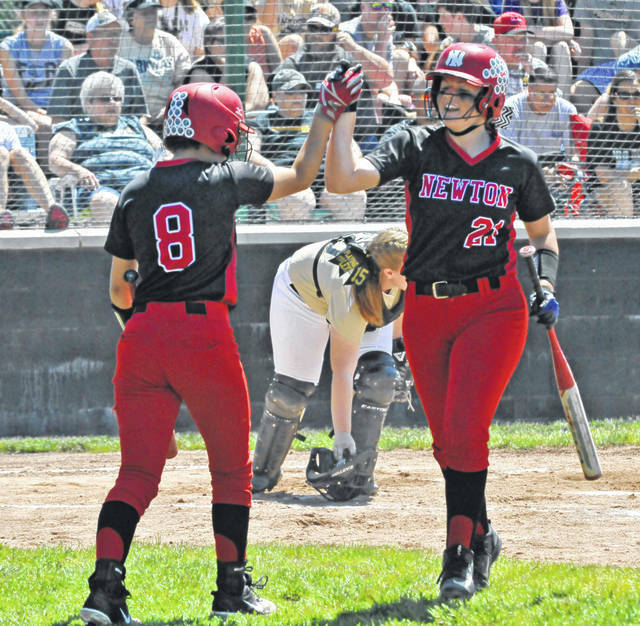 Josh Brown|Miami Valley Today file Newton’s Brooke Deeter (21) is congratulated by Ashlyn Deeter (8) after scoring a run during a tournament game last season. Josh Brown|Miami Valley Today file Milton-Union senior Olivia Brown returns for the Bulldogs this season. Josh Brown|Miami Valley Today file Tippecanoe’s Corinn Siefring returns for the Red Devils this season. PIQUA — Greg Campbell takes over as Piqua softball coach. Campbell has five years experience coaching high school softball in Indiana and eight years of “select” coaching experience. The Indians finished 6-21 overall and 5-10 in Greater Western Ohio Conference American North Division play last year. Graduating off that team were Sarah Marion and Lily Stewart. Returning letterwinners include seniors Kylie Trissell, Kamy Trissell, Mariah Blankenship and Jazmine Lattimer; juniors Hannah Anderson and Kathy Young; and sophomores Paige Hinkle, Kylee Angle and Abriel Thompson. “Piqua will be looking to greatly improve on last year’s record,” Campbell said. “We have set some internal goals to improve our offensive output and reduce our defensive miscue’s that plagued last year’s team. “We will rely heavily on the pitching of returning senior Mariah Blankenship as well as the senior leadership of Kylie and Kamy Trissell and Jazmine Lattimer. Hannah Anderson, Kathy Young and Paige Hinkle will combine with some upcoming young talent to round out our team. Last year, Milton-Union won the Southwestern Buckeye League Buckeye championship, its first division title since 2011. With what the Bulldogs have coming back, they should be in contention for a repeat. “We should finish in the top of of the league and make some noise in the tournament,” said Milton-Union coach Curt Schaefer as he enters his 10th year with the team. 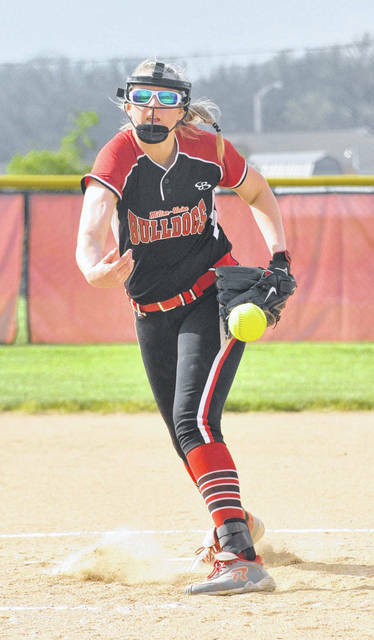 Leading the way for the Bulldogs will be junior Courtney Seevers, an All-Ohio selection last season, and junior Lizzie Oaks, who was second in the SWBL in home runs with eight last year. Both will play the outfield, with Oaks also pitching. Also back on the mound will be senior Olivia Brown and sophomore Madison Jones, with senior Audrey Smith taking over the catching duties. Jones will also play the infield when not pitching along with senior Annika Hutchinson and juniors Bree Nevels and Kya Swartztrauber, all returners. Even though the Red Devils still boast an incredibly young lineup after starting six freshmen and going 14-11 last year, those lumps could very well pay off as Tippecanoe looks to contend in the Greater Western Ohio Conference American North Division. “This will be a tough year. Some teams are rebuilding, while we are building on the experience our young players gained last year,” said Tippecanoe coach Scott Sutton, who will be in his fourth year at the helm. 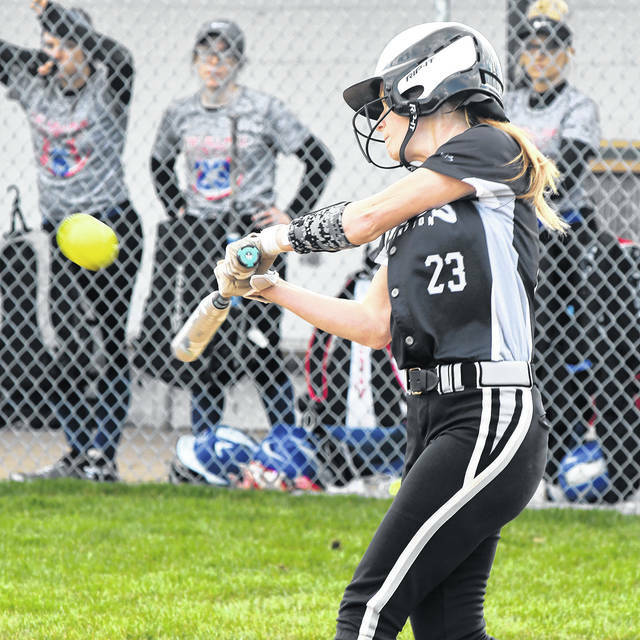 “We started six freshmen in 2018, but we feel we can compete for the GWOC North championship this year if we continue to grow and do what we do best … softball. That one senior in the lineup for the Devils is shortstop Brooke Aselage, who was third in the GWOC with a .595 batting average last season. Tippecanoe also returns its pitching staff, with junior Kayla Runyon coming back from an injury and sophomores Savannah Wead and Emma Miller both having gained valuable experience in her absence. Also back for the Devils will be junior catcher Brooke Silcox and sophomore second baseman Kaitlyn Husic, with sophomores Corinn Siefring, Sidney Unger and Emma Watkins returning in the outfield. Among the newcomers to varsity are sophomore Allie Uzzel and freshman Kaela May, who will play infield, and sophomore Alayna Liskey in the outfield. After a trip to the regional semifinals last season, fourth-year Newton coach Mark Gibson has set lofty goals for the Indians this season. Senior Erin Norman returns to lead the pitching staff, with junior Brooke Deeter and freshman Laci Miller sharing time on the mound and sophomore Marissa Deeter and freshman Molly Norman catching. Senior third baseman Mallory Dunlevy will anchor a veteran infield along with junior shortstop Baily Chaney, junior second baseman Kara Chaney and Brooke Deeter and Erin Norman sharing time at first base, depending on who is pitching. And in the outfield, sophomores Addison Peters, Ashlyn Deeter and Haley Abrams and freshman Camryn Gleason will compete for time. Phil Smith returns for his second season as coach. The Buccaneers finished 10-8 overall and 7-5 in the CCC last year. Graduating off that team were Sarah Hubbard, Emma Dammeyer and Noelle Gast. Returning letterwinners include senior Makenna Gostomsky, juniors Kirstie Barnes, Layklyn Kemp, Kenzie Long and Morgan Studebaker and sophomores Allie Garman, Hailey Jackson, Ra Shell Reed and Bethany Weldy. “Our goal is to have another winning season, avoid injuries and and to maintain high GPAs,” Smith said. Smith is hoping for a top-five finish in the CCC. Brian Kadel is back for his ninth total season with Miami East and his second in his most recent stint, and the young-seeming Vikings are looking to continue improving. Junior Paige Lawson returns as the team’s pitcher, with freshmen Kyleigh Kirby, Kalli Teeters and Kaitlyn Roop adding depth to the staff and freshmen Kenzie Noble and Braven Mills behind the plate. Senior Sam Urban, who hit .444 last year, will compete for time in the infield along with sophomores Abigail Covault and Morgan Hamby, freshman Kayly Fetters and Lawson, Kirby and Roop. And in the outfield, seniors Ashley Covault and Faith Robinson and sophomores Cassidy Walker, Arielle Barnes and Erin Hamby will compete for time along with Teeters. Brent New returns for his 22nd season as coach. The Wildcats were 12-11 overall last spring and 8-4 in the SCAL. Graduating off that team were Sarah Monnier, Rebekah New and Brooklyn Felver. Returning letterwinners include seniors Emilee Foster, Addie White and Olivia Bowser and junior Allisen Foster. New is hoping for a top three finish in the SCAL. Bill Booth returns for his 31st season as coach. Graduating off last year’s team were Hailey Wick, Brogan McIver, Amanda Titterington, Abby Jones, Maddy McFarland and Caitlin Swallow. Returning letterwinners include seniors Grace Monnin, Grace Brandt, Carly Edwards and Madelyn Kirtley; juniors Abby Schutte, Angela Brunner and Hope Anthony and sophomore Anna Cianciolo. Booth said pitching will be the key. Booth expects to finish in the top three in the NWCC. After two seasons without softball, the Troy Christian Eagles are back, and Heather Douglas knows just what is in store for the team. Juniors Samantha Lenz and Jenna Douglas will handle the pitching duties, with freshman Eleanor Helstad behind the plate. Douglas will also play third base and Lenz shortstop when not pitching, with freshman Courtney Eschete at first base and seniors Cara Salazar, Jalyn Forrer and Carolin Lozano, junior Lexi Salazar and freshman Ellie Scheckel all competing for spots. And in the outfield, seniors Samantha Melvin and Cayleen Harvey and freshmen Hailey Howard and Natalie Courter will compete for playing time along with Lydia Ammon. Michelle Muhlenkamp returns as coach. The Raiders were 17-9 overall last year and 12-0 in the SCAL. Graduating off that team were Lexi Monnin, Grace Saunders, Lauren Monnin, Kylee Sherman, Claudia Counts and Becky Pinchot. Returning letterwinners include seniors Shea Borchers, Jenna Cordonnier, Savannah Albers, Kennedie Goubeaux, junior Olivia Moorman and sophomore Kendal Monnin. “This year we will be filling several spots with new faces,” Muhlenkamp said. “This is very exciting for us as a coaching staff, because we feel like this group of athletes are accepting the challenge of stepping on the field and getting their job done in their position and at the plate. Chris Floyd returns as softball coach. The Tigers were 10-10 overall last spring and 5-2 in the MAC. Graduating off that team were Anna Gehret, Mallory George, Cori Lawrence, Hailey McEldowney, Kami McEldowney and Kate Stammen. Returning letterwinners include seniors Faith Huddle, Caitlyn Luthman and Rachel Lyons; juniors Hannah Barga, Makenzie Knore (honorable mention All-MAC) and Caitlin McEldowney (first team All-MAC) and sophomore Lauren Monnin. “I am looking forward to the upcoming season,” Floyd said. “This team is energized with youth and coupled with senior leadership from Faith Huddle, Caitlyn Luthman and Rachel Lyons, we hope to continue to improve our program to the standards the girls volleyball and basketball programs set. The goal is to win the MAC, get to district and advance. https://www.dailycall.com/wp-content/uploads/sites/30/2019/03/web1_kathyyoung.jpgMike Ullery|Miami Valley Today file Piqua’s Kathy Young returns to the softball team this season. https://www.dailycall.com/wp-content/uploads/sites/30/2019/03/web1_layklyn-kemp.jpgMiami Valley Today file Covington’s Layklyn Kemp makes contact during a game last season. https://www.dailycall.com/wp-content/uploads/sites/30/2019/03/web1_052318jb_new_bdeeter_adeeter.jpgJosh Brown|Miami Valley Today file Newton’s Brooke Deeter (21) is congratulated by Ashlyn Deeter (8) after scoring a run during a tournament game last season. https://www.dailycall.com/wp-content/uploads/sites/30/2019/03/web1_050218jb_mu_oliviabrown.jpgJosh Brown|Miami Valley Today file Milton-Union senior Olivia Brown returns for the Bulldogs this season. 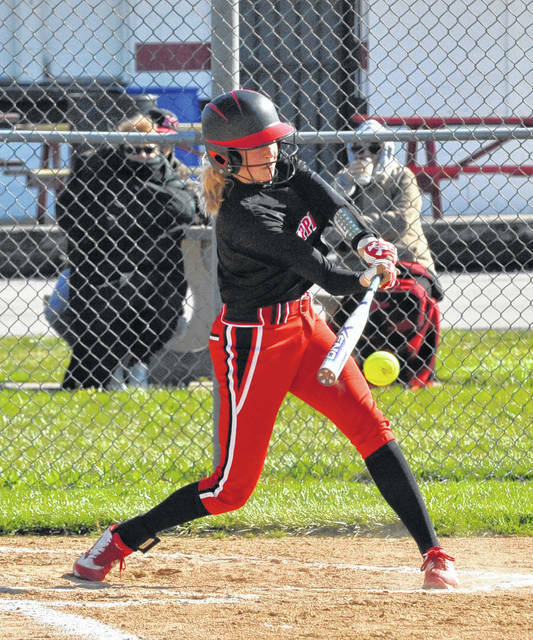 https://www.dailycall.com/wp-content/uploads/sites/30/2019/03/web1_041918jb_tipp_corinnsiefring.jpgJosh Brown|Miami Valley Today file Tippecanoe’s Corinn Siefring returns for the Red Devils this season.